More friends! We love getting together with friends. 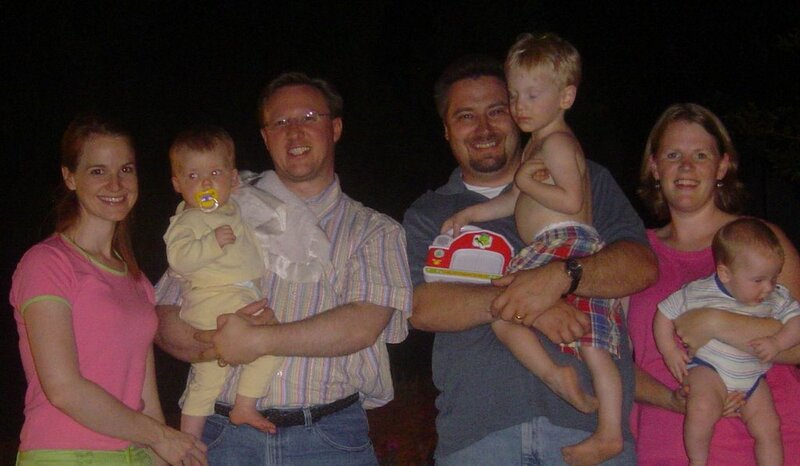 Tonight, we visited with Scott and Leesa and their children, Elizabeth and Sydney. They are moving to St. Louis next week where he’ll be starting seminary at Covenant (I’ve told them to seek you out, Kicklighters and Tuckers!). We love this family so much and will miss them after they leave. God has blessed us with many close relationships! Shea and John Mark Patrick (our friend and guy with three first names) were in our area visiting their family for the long weekend and invited us to their lake house to play (at Lake Harding). It was Andrew’s first time on the water and he loved it! 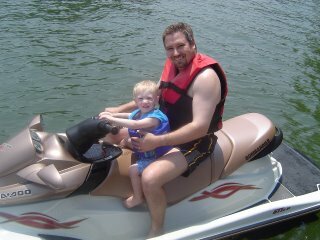 First, we relaxed while riding around in the pontoon boat and then we played on the SeaDoo. 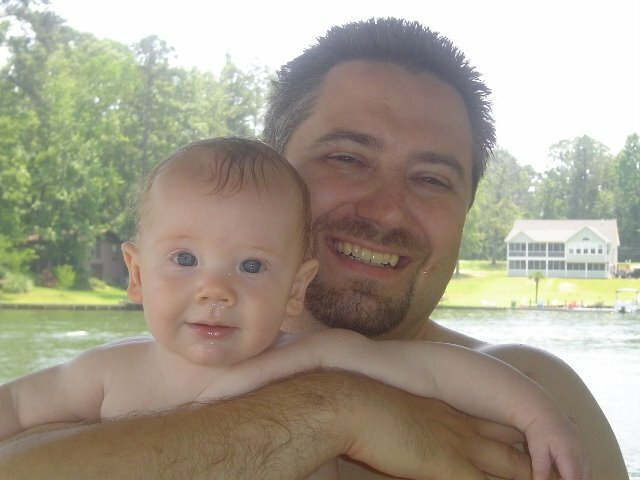 It was fun to jump in the lake and swim around to cool off ’cause it’s humid and hot here! Shea and John Mark are awesome friends and were excellent hosts. Thank you for letting us spend Memorial Day with you on the lake! Laura came to visit us again this weekend. We love it when she’s here. Not only is she super with my boys (although she’s not here to babysit) she’s a great friend whom I enjoy spending time with and talking to. We took the boys to the park this morning where we walked two miles before eating our sack lunch and playing on the playground. Here is a picture of Laura playing with the playdough on the floor with Andrew and Luke. If it were up to me, I would have Laura come visit everyday….I’m just glad Auburn University is only 45 minutes away! Boy, has it been hot these past few days. 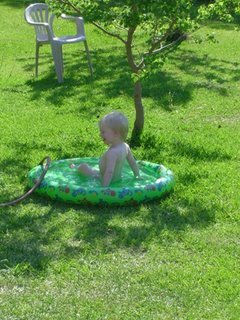 After waking from his nap the past three afternoons, Andrew has spent a few hours outside playing in his small pool and sprinkler. It’s so hot that he didn’t even want to wear his swimsuit…..so, I let him go naked. Why not? I mean, he was in the backyard where no one could see him! He had a blast. Andrew put his Pull-Up on all by himself today. He ended up with both legs in one leg hole. I tried to fix it but he wouldn’t let me. So, he walked (waddled) around the house, strutting his “bad self”…..he soon came to his senses and allowed me to make the proper adjustments. We are home…..the journey north this past weekend went smoothly but the drive-time home was hard. We thought that both of the boys would be extremely tired and would quickly fall asleep in the van on the way home; however, they were SO tired that it was too late and they cried almost the entire three hours home (we’ll maybe not all three hours, but it felt like it – it was probably just an hour’s worth of crying). We’re glad to be in our own space, enjoying the familiarity. The wedding reception was held at Chicopee Woods in Gainesville last night. It was absolutely beautiful! Today, before leaving the Atlanta metro area, we stopped at the Mall of Georgia to eat and play. 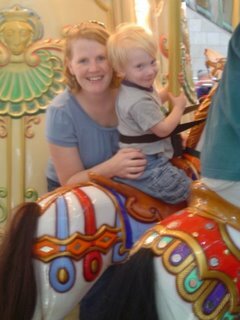 Andrew loves riding the merry-go-round so Daddy snapped a picture of us enjoying the ride. 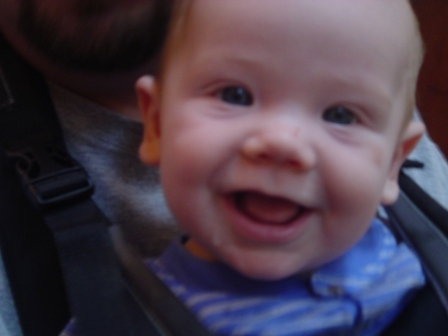 Luke was strapped on Mitch’s chest in the Snuggli so I grabbed the camera and took a picture. I love spending time with all my boys. We are in Gainesville, GA, this weekend for a wedding. We visited one of the parks that sits on beautiful Lake Lanier where I captured this moment between Dad and son. 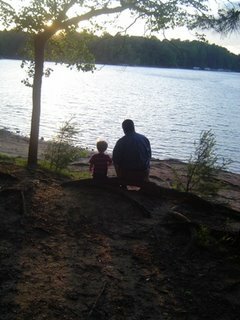 They were talking about the water and then started watching it ripple as they began throwing rocks.